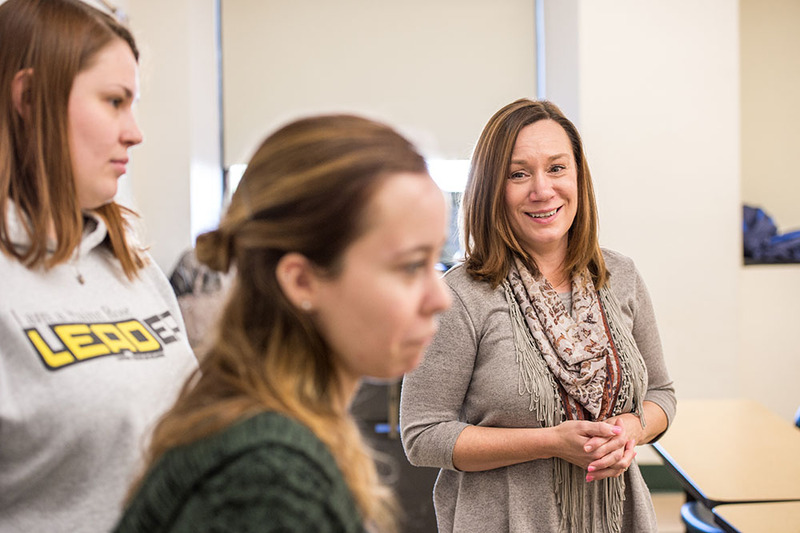 Saint Rose professors teach their students without relying on teaching assistants. They lead small classes and make themselves available to support their students individually. But professors across the College also work in the disciplines they teach. 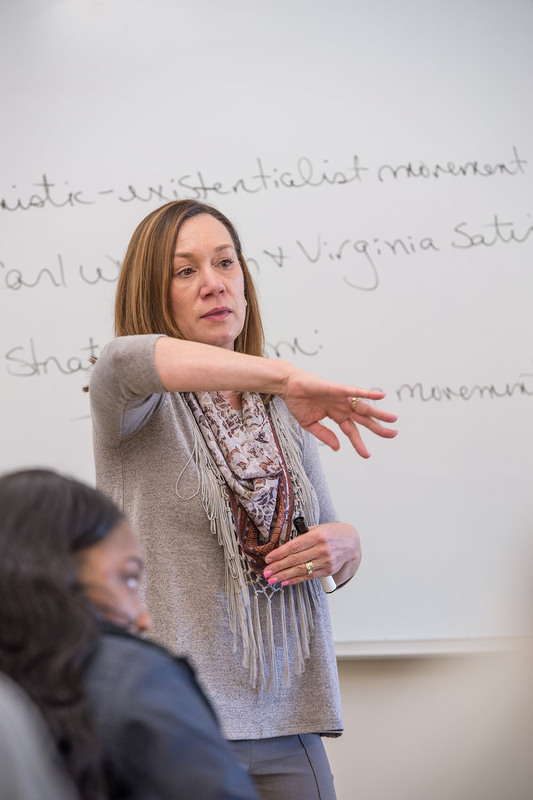 Their students benefit by moving beyond the theory to hear first-hand what happens in the field on a given day. Practicing professors are able to help students with their own fieldwork – suggesting an approach to a challenge or whom to contact for assistance. Students also leverage their professors’ professional contacts to net valuable internships and job leads. Expertise: diagnosing and treating pediatric mental health disorders; interviewing individuals who have been sexually abused; testifying in state and federal criminal and family court. I’ve never not practiced. For me, social work is a vocation more than a career choice. Our field changes every day. Just look at the current political climate. Our work ties to health care, immigration policy, veterans services. Our whole (Saint Rose) social work department works in the field; doing program assessments, grant writing, at United Tenants of Albany, with hospice, projects overseas. Part of social work is helping people find their way. We have an ethical obligation. I called Albany Med in 2012 to see if we could place students in internships. The director of social work said they had an opening in the emergency department and asked if I would be interested. This would allow me to pull together everything I’ve done in my area. I got the College’s permission and wound up working noon to midnight every other weekend from 2013 to 2017. Now I work per diem, at least one 12-hour shift a week. Our students are also there. I’ve had nine students intern with me in the E.R., and we’ve had students in the pediatric ICU and general pediatric floors. They sometimes work independently, but I’m always providing supervision. I get to sit down with new emergency room residents and say, ’Here’s what social work is about.’ They need to understand what we do and that we are part of the team. We are helping them develop interpersonal skills. It’s hard to tell parents their 6-year-old child has just died, and we did everything we could. It’s a skill people don’t want to have but they have to have. My first day on the job, my first 15 minutes, a pediatric cardiac arrest came in. They were not able to reverse the arrest no matter what they tried. I stood by and helped the family through the initial shock. Sometimes, at the start of the shift, I say, ‘No sad things are going to happen on my shift today!’ Some days are really hard. We had a pediatric cardiac arrest. A (former) Saint Rose student, who became a nurse, was doing compressions. I could see the tears falling onto the baby. The doctor called the time of death, and the nurse ran past me. I know I need to be with the parents. I’ve also known the nurse since she was a freshman; she’s one of my kids. I went to the parents and stayed with them and found her afterward to offer debriefing and support. Medicine loses good people every day. We need to do all we can to support them. We can get people the right services: like detox, like getting folks with no health insurance connected to agencies to get it, or connecting people who have no primary care doctor, or people who are homeless. There was an elderly couple from three hours away who came in by ambulance with $50 and no way to get home. It’s 11 o’clock at night, and it’s our job to figure this out. Alex LaFrance, a Saint Rose student interning there, suggested, ‘Why don’t we buy them a bus ticket to Kingston and them have them take a taxi?’ It was brilliant. The hospital could pay for the bus. I called a cab company and explained. The driver said, ‘It’s fine. I’m the owner. I won’t charge them.’ He made sure he was there when they got off the bus and got them home. Is that some major clinical breakthrough? No, but it was a way to get them home, and it was social work, and it was a Saint Rose student who thought of it. You might see someone who is suicidal or homicidal or both. I think the psychological part is equal to, and as challenging as, physical pain. We help folks manage the pain and get to a place where they’re not experiencing pain as much. That is important because at that moment they won’t hurt themselves or the people they love. There are definitely times when I think, ‘How did that work out over time? Did that person have a good outcome?’ But I’m not entitled to that information. 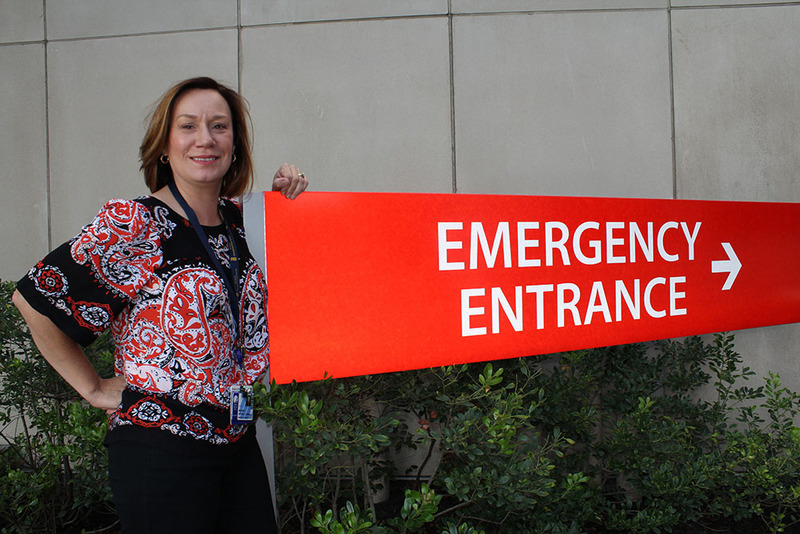 A child comes into the ED, dying because of a trauma or a terminal illness. I stay with the family through the most unimaginably painful moments of their lives and often continue to provide support to them when their child is admitted to the hospital. When the time comes to withdraw care and let the child go, there have been times when a family has asked me to be with them while care is withdrawn. Watching a family lose their loved one, particularly when it’s a child, is devastating. I can remember one morning, coming in at 5 a.m., being with the parents as they held their child for the last time. I watched as he passed, and I said, ‘Thank you for the gift of knowing your child.’ Then I came here to teach. I had a class at 9:25 a.m.
That day, we were going to talk about approaching professional boundaries, what you do in tough cases in terms of self-care. It was appropriate. I was so raw. The opportunity to be in the moment with the students helped me process some of my feelings and demonstrated for them the professional process. I was a lot more human to them. Our clinical experience has allowed (Assistant Professor of Social Work) Janet Acker and I to build the new master’s program (Master of Science in Social Work.) If you don’t practice, it’s difficult to know what to teach students. We want to raise great social workers. We want people in the field who are the best at what they do. I love teaching, and I love to practice, and I get to do both. I have the best of both worlds.